At the same time, something similar is happening between France and Morocco. Many young educated French-born people with Moroccan roots decide to migrate to the country of their parents or grandparents. They have access to better jobs and social recognition in Morocco. Life is still pretty difficult for people with an Arab name in France.What if, within a few decades, the South-North immigration trends got reversed? I can see some analogies between the Angolan example and European immigration to America in the 19th century. The European system is slowly but surely getting overcrowded, demographically and environmentally. As in the 19th century, the surplus workers will probably have to try their luck someplace else. Although Africa is not likely to become a Dubai-style Disneyland for Western luxury addicts, it’s a land of opportunities. Just like America a couple of centuries ago, it’s a vast space with plenty of unexploited natural resources – a wonderful potential for skilled entrepreneurial people. Surely, some European brain drain would do Africa good. But at the same time, history throws its shadow on the two continents’ relations. So is this the first sign of a major shift in Africa’s position on the world economic stage, or is all this purely and simply neo-colonization? I guess that’ll depend on the mindset of the migrants and their hosts. According the Courrier International report, Portuguese people in Angola call themselves ‘expats’, not immigrants. How about a nice politically correct neologism as a first step? Any ideas? Thank you very much for bookmarking us, Parejas. 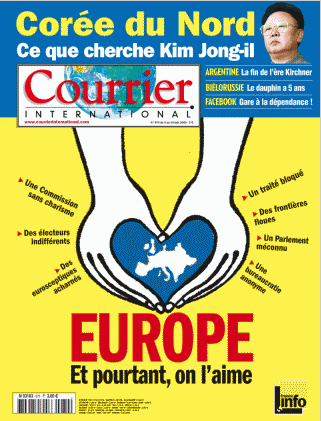 I’m a fond reader of Courrier International, too. It’s great to have access to translated articles from all over the world in this way. Does anyone know a newspaper with a similar concept in English?